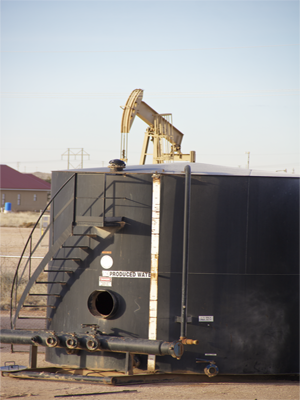 Test Tanks or Vertical Tanks are commonly used for fluid recovery from flow-back procedures, storage of fluid for drilling rigs, and temporary tank batteries or production facilities. Each tank has an outside gauge board and is equipped with a spiral stair-case and landing for your safety and convenience. The storage capacity is 400 BBL. They also are equiped with a thief hatch.